Showing results by narrator "Marty Feldman"
At Last the 1948 Show is a classic satirical TV series that inspired Monty Python. Featuring Cambridge footlighters John Cleese, Tim Brooke-Taylor and Graham Chapman, this is arguably the finest sketch comedy series ever produced and certainly something you do not want to miss.... This is a large collection of the very best sketches from the first and second series of the show. At Last the 1948 Show is a classic satirical TV series that prided and inspired Monty Python. Featuring Cambridge footlighters John Cleese, Tim Brooke-Taylor and Graham Chapman, this is arguably the finest sketch comedy series ever produced and certainly something you do not want to miss.... This volume features a compilation of classic sketches from the second series of the show. At Last the 1948 Show is a classic satirical TV series that prided and inspired Monty Python. Featuring Cambridge footlighters John Cleese, Tim Brooke-Taylor and Graham Chapman, this is arguably the finest sketch comedy series ever produced and certainly something you do not want to miss.... This volume features a compilation of classic sketches from the first and second series of the show. 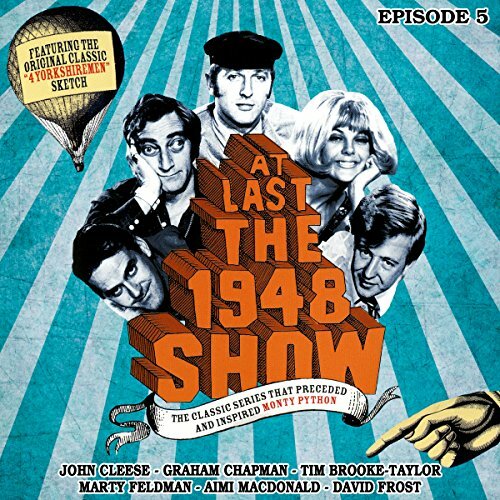 At Last the 1948 Show is a classic satirical TV series that prided and inspired Monty Python. Featuring Cambridge footlighters John Cleese, Tim Brooke-Taylor and Graham Chapman, this is arguably the finest sketch comedy series ever produced and certainly something you do not want to miss.... This volume features a compilation of classic sketches from the second series of the show, including: Shirt Shop, Nosmo Claphanger Game Show, Insurance for Accident-Prone Man, Uncooperative Burglars, Thuggish Ballet Supporters. At Last the 1948 Show is a classic satirical TV series that prided and inspired Monty Python. Featuring Cambridge footlighters John Cleese, Tim Brooke-Taylor and Graham Chapman, this is arguably the finest sketch comedy series ever produced and certainly something you do not want to miss.... This volume features a compilation of classic sketches from the first series of the show.